I had researched online for area stables for our trip. 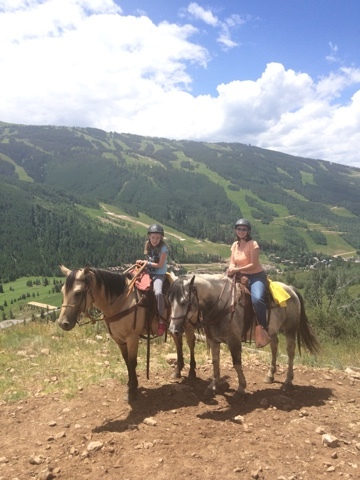 Vail stables had great reviews and several different trail rides to choose from. 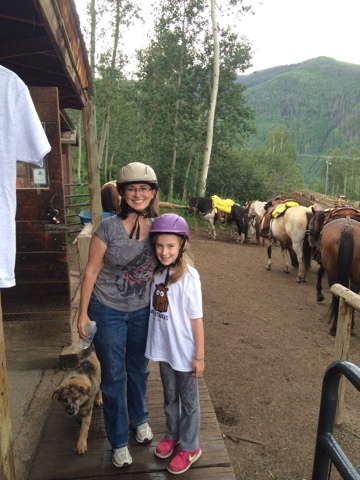 We actually ended up scheduling 2 rides with Vail Stables because we had such a great time on our first ride. Our first ride ended up being a private tour for me and Alice. Our trail leader was Avery and she was great. She was good with Alice and gave lots of interesting facts about the area, trees and wildlife. Our second ride was with a large group of 12. There were 2 trail leaders, one at the front and one in the middle to keep tabs in the group. I was glad we had prior experience since we didn't get individual attention on this ride. For this one, we were the 'experienced' riders. 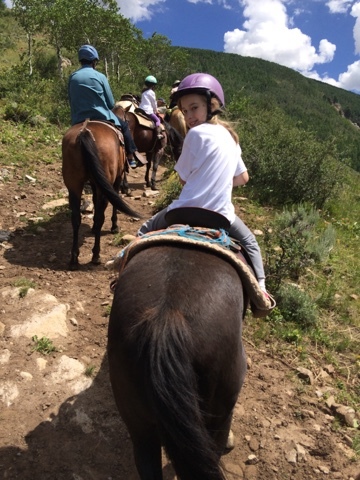 Alice did a great time handling her horse on the longer ride. Alice's horse for this ride was named Clint and I rode Habinaro. Both horses were gentle and took directions well. On our last leg down the trail, it began to rain. We got wet, but not soaked.